This is the finished mushroom house, which my girls got for Christmas this year. First, you will need a concrete tube. Cut the tube to be about 8″ high with a hacksaw. Then, draw the doorway and windows. Use a serrated knife to cut these out. 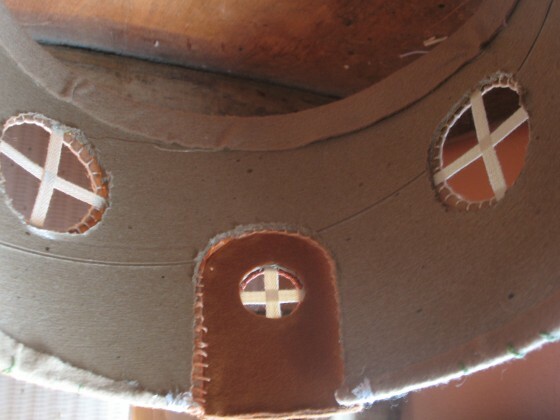 Cut pieces of ribbon and glue them on the windows to make panes. Yes, I used my trusty ol’ hot glue gun this project. Cut out a piece of felt long enough to go around the whole tube, with extra room on the top, bottom and ends (for gluing over the edges). 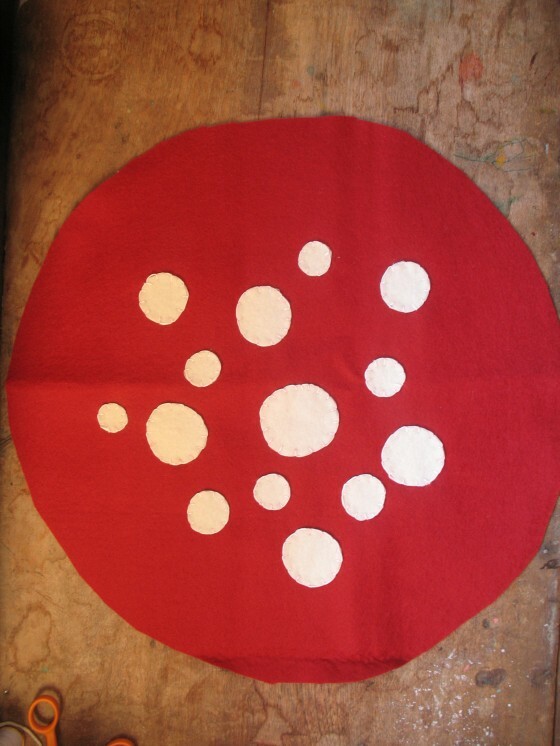 My felt piece was about 36″ long and 10″ wide. Then cut out the doorway and windows, *slightly smaller* than those that you cut on the concrete tube. 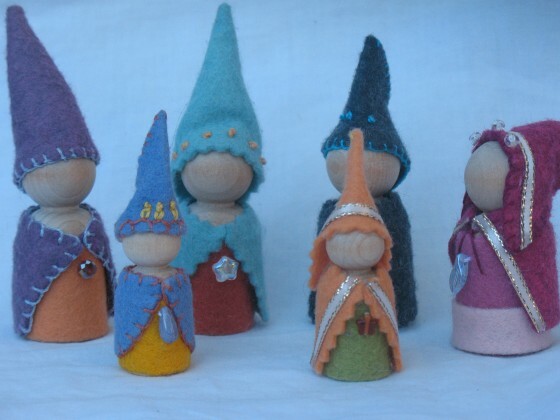 Then, decorate the felt however you wish, with buttons embroidery thread, beads, etc. Cut out a cardboard door to fit the doorway opening. 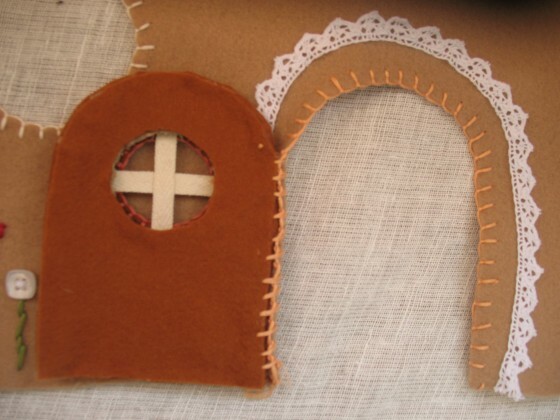 If you wish, cut a window as well, covering with ribbon to make the window panes as before. Cut a *slightly larger* felt door to fit the front of the door, don’t forget the window circle needs to be *slightly smaller* than the opening on the cardboard door. 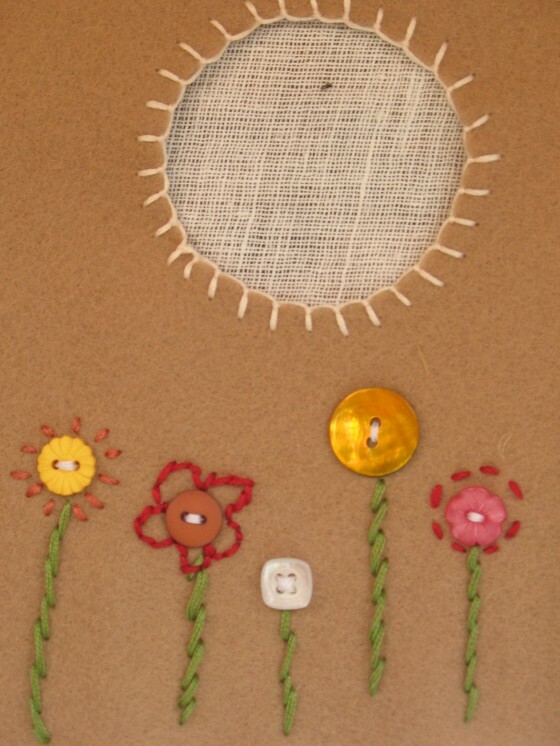 Decorate this felt piece. Glue this piece to the cardboard door, extending the longer edges around the back of the door. 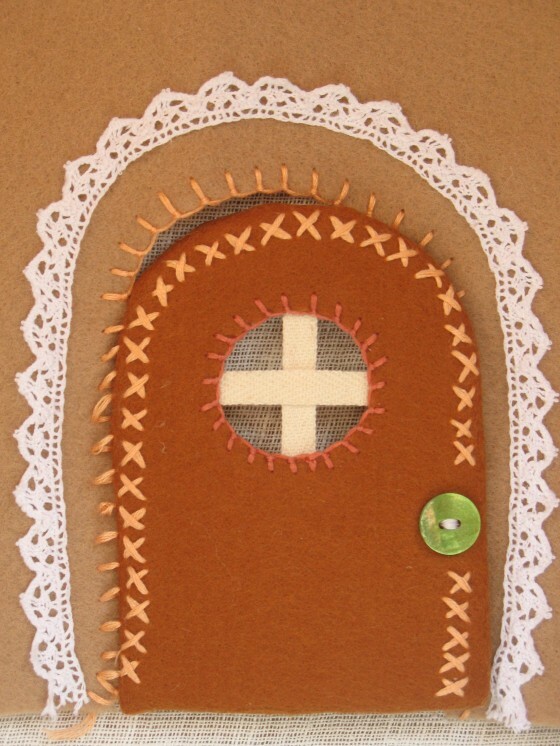 Cut a piece of felt to cover the back of the door, covering your already-glued edges, for a finished look. 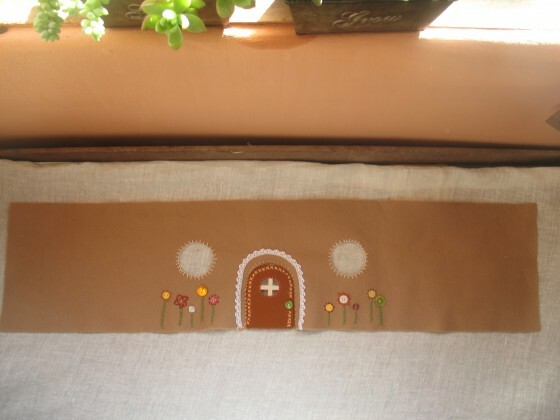 Attach your door to the door opening with embroidery thread. Here is a detail shot of the flowers. Glue the whole thing to the tube, extending the edges to the inside of the tube. As you can see, the rough cut door and windows don’t show from the outside. 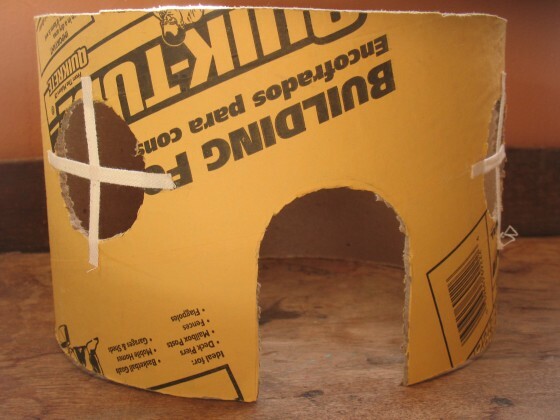 Make a cardboard floor by tracing the round bottom of the house on a piece of cardboard, then cut with the serrated knife. Cut a *slightly larger* piece of felt to fit on the floor. 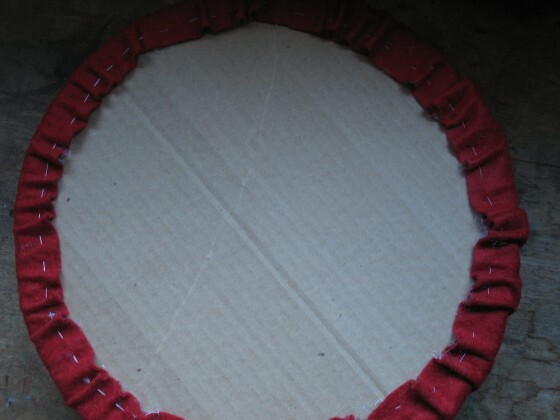 Glue the floor onto the cardboard, extending the longer edges around to the bottom of the house. 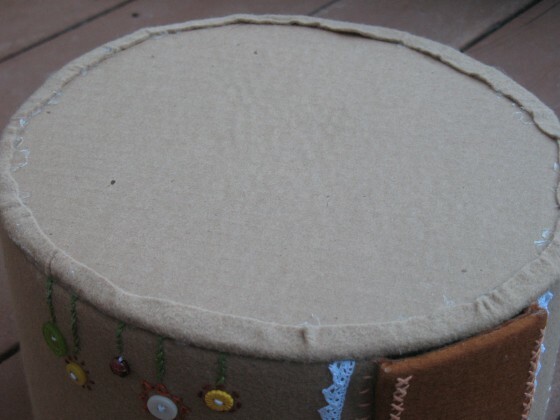 Cut out a large round piece of cardboard to be the top of the mushroom, mine is about 13″ wide. 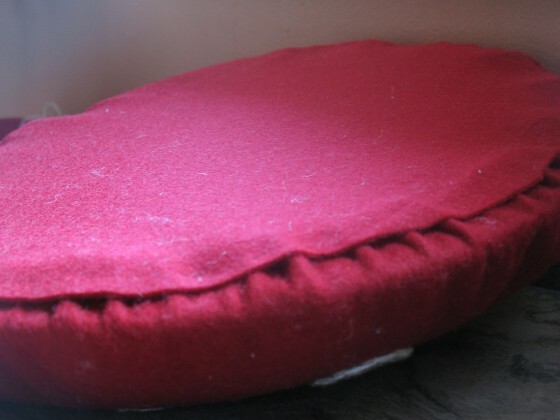 Then cut a *slightly larger* piece of red felt. Cinch up this running stitch and tie a strong knot. Glue edges down. 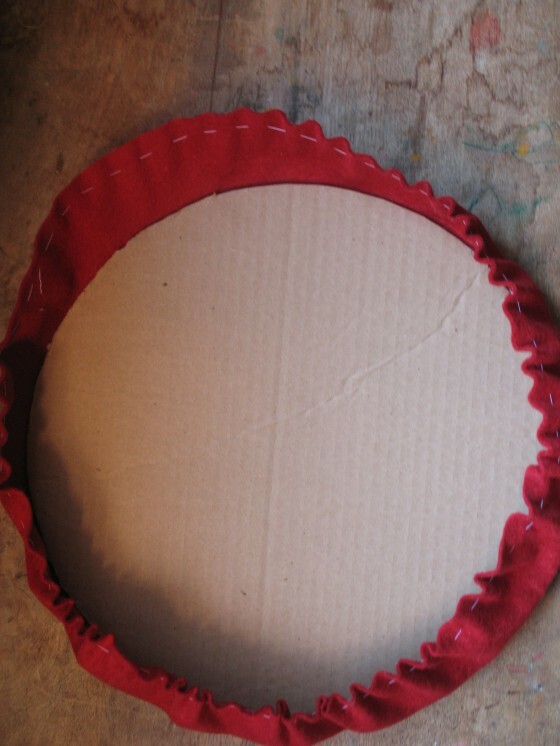 Cut a large round piece of felt and glue this down over the whole bottom, covering the stitched edges. I didn’t attach the mushroom top. I just simply placed it on top, so that it is easy to get little things in and out of the house. 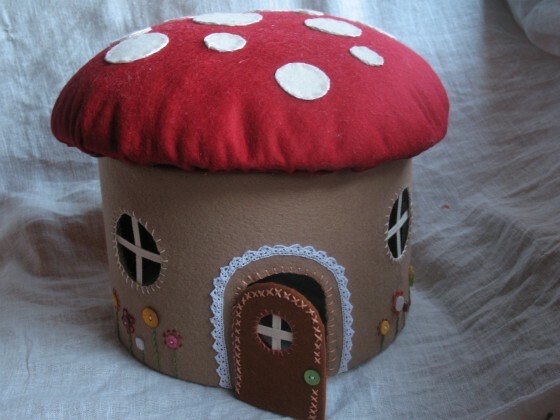 What mushroom house would be complete without some little elves to live in it? 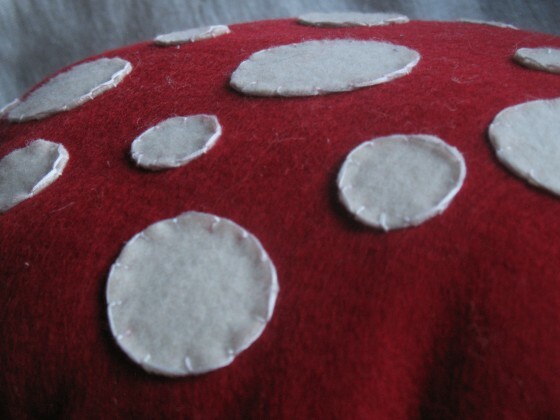 You might also like my felt strawberry tutorial and free pattern. Becca you absolutely amaze me! This is so cute and the amount of detail you put into it is fabulous. You could totally sell these. I can’t imagine how long it took to make all the little people, flowers, etc. You are very talented and your girls are lucky to get such a special gift. This is amazing!! What lucky girls you have!